How To Fix A Kitchen Faucet: repair a leaky fixture and more! How To Fix A Kitchen Faucet: repair a leaky fixture, upgrade components, and more! Leaky or sluggish faucets are a major annoyance, but they’re only a minor problem! Even if you don’t have much DIY plumbing experience under your belt, you should be able to get most kitchen faucets shipshape in well under an hour. Why fix your faucet yourself? You don’t need to do much besides take things apart and put them back together. There’s no soldering, cutting, or other “skilled” bits involved. As long as you can unscrew components and keep them organized, you have all the skills you need! With many manufacturer warranty policies, you’ll have to send in your old faucet for replacements or repairs. That can mean weeks without a functioning kitchen. Doing simple repairs yourself is often much more practical (see below for some instances in which you may want to go ahead and use the warranty coverage). You can usually find replacement parts cheaply. Faucets from Moen, Delta, and other major brands are stocked at any good hardware/DIY store. You can sometimes even get identical ones through your warranty coverage! Store-bought replacements are actually quite good, too. Many are better than the components that came with your fixture, especially if you’re working with an older one! You don’t have to deal with the manufacturer. If you inherited your faucet from a previous owner, chances are you don’t have the warranty and registration information to request repairs from the manufacturer. It’s much easier to handle the issue yourself than try and finagle some grudging service from an unhelpful customer support department. You can’t easily find parts. If you can’t find parts near you, or online, you may want to go ahead and contact the manufacturer. They may do any number of things: send a replacement unit, ship you a fix-it kit, or ask you to send yours in for repairs. If it’s too frustrating to have to pay to send your fixture back to them and wait, request replacement parts. They ought to be free, and then you’ll have identical replacements to install yourself. You’re not a confident DIYer. If you don’t feel comfortable pulling apart a faucet, don’t feel like you have to! The point of this is to do it yourself because it’s easy and convenient. If it doesn’t feel either of those things, skip it and contact the manufacturer or a plumber. You’ve bought your faucet recently and have it registered under warranty. In this case, you shouldn’t have to bother doing anything yourself. Request a replacement unit or a fix-it kit from the manufacturer. Worst case scenario, you’ll just have to swap seals out yourself. Anything sold in the last few years should have a lifetime warranty covering any and all issues. Use that rather than voiding your policy by tampering. You can’t take it apart. If you can’t take your faucet apart using the techniques below, don’t try to jimmy-rig it. Call the manufacturer and ask if there’s a special way to get it apart, or whether you can get a replacement sent to you. You’re not going to have to pay for return shipping/repair costs. If you call the manufacturer and speak with someone helpful, take advantage! It’s a rare thing these days. Ideally, a warranty should provide you with a replacement unit shipped promptly to your door. You shouldn’t be expected to pay return shipping or wait weeks for a unit to be repaired. As long as the manufacturer is treating you well, just wait for the replacement to arrive and install that! Find the source of the leak (if there is one). If you’re fixing a sluggish spout, see below, or simply take the whole thing apart and look for debris and deposits. Is the leak at the end of the spout, or is it coming from the base? The correct approach to fixing a leak will depend on where it actually is, so figure that out before you shut the water off. If your leak is coming from the base of the spout, good news! You likely have a very easy problem to fix. Leaks around the base of a spout are usually down to worn out o-ring seals. All you have to do is take the spout off. That doesn’t even require tools, most of the time. Many faucets have removable spouts that will lift off with a bit of coaxing and wiggling. In some cases, you’ll need to unscrew a few components. Regardless, it should be simple. Consult your manual if you have one, or google a manual for your faucet model. Once you’ve removed the spout, use a screwdriver to pry off the old seals. Get yourself some matching seals at the hardware store, lubricate them well, and fit them snugly where the old ones were. If your leak is coming from the base of the spout and replacing seals doesn’t work, you’re going to need to take the whole thing apart and do some bigger repairs. That’s also true if it’s coming from the end of the spout. You might have a cartridge or valve issue, or need to replace something further into the mechanism. Get yourself a good repair kit, and then follow the steps below. Don’t be daunted–it’s still relatively easy! Use the shutoff valves under your sink to stop water flowing to your faucet. If you don’t have them, you’re going to need to turn off your whole water supply. That’ll be true anytime you need to do plumbing fixes, so adding shutoff valves should be on your list of to-do’s! Dealing with them is much more convenient. Leave the faucet wide open to drain out any remaining water. This is to catch any small parts that might fall into the sink as you work. You don’t want them going down the drain by accident! Set them out in the order they were removed, so you know what order to use when you put everything back together. Once you’ve taken everything apart, have a look at the valve.You’re looking for deteriorated gaskets or mineral deposits Use a cloth soaked in vinegar or a fine abrasive pad (nylon, preferably) to loosen these and clean the surfaces. If there are lots of mineral deposits, soak components in vinegar. You can also spray it on, if that works for you and you have a spare spray bottle handy. 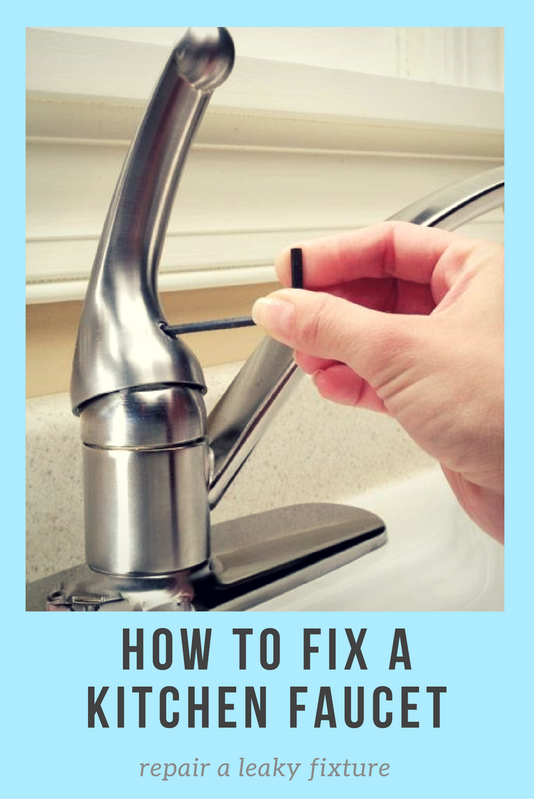 At this point, you’ll also need to inspect all the components in the interior of the faucet, like the seat and the other seals that you didn’t see when you lifted off the spout. Follow the Family Handyman instructions, and you’ll be good as gold to fix leaks at both the base and end of the spout. There are a few different things that can cause sluggish flow on a kitchen faucet. They’re all to do with debris and deposits, though. So, the key thing to do here is take everything apart and give it a good cleaning with vinegar and an implement. Usually, you’ll see a number of small holes inside the body of the faucet. Water ought to be able to flow freely through them. Use pipe cleaners or a screwdriver to clear them out. Restricted flow can also be traced to the aerator in some cases.You can easily unscrew it and clean it which is easiest done by soaking it in vinegar for a few minutes and then scrubbing/rinsing. If you’re doing any cleaning of debris or deposits, open the shutoff valves slightly before you put everything back together. That’ll flush out all the loosened debris. Having trouble with a sprayer? Unscrew the head and soak it with vinegar. 9 times out of 10, that’ll solve the problem. Sprayer heads get clogged with mineral deposits very easily. This is also a good thing to do to prevent mold issues. Once you finish putting things back together, turn the shutoff valves back to the open position, and let the faucet flow freely. Check for any sluggishness or leaks, so that you can see whether you were successful. Hopefully, you were! If you’ve done your best with a repair kit but can’t completely resolve leaks, you probably have a crappy faucet to begin with. If there are any plastic components, especially plastic innards, you’re better off just upgrading to a high-quality fixture. Find our recommendations for the best kitchen faucets here!